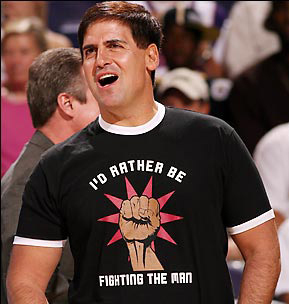 You can’t have a Mark Cuban speech without at least one contrarian statement. In the past year alone, the HDNet founder has sounded off on everything from YouTube ("A million people watching three-minute clips of Lonelygirl is critical mass?" he said during Advertising Week) to local newspapers ("They’re trying to grow like they’re internet companies in 1999," he told Esquire). His latest target? The web. Did you hear? It’s dead. Speaking at the Cable Telecommunications Association for Marketing (CTAM) Summit in Washington yesterday, Mr. Cuban declared "the Internet is dead" in an otherwise subdued panel that included executives such as ESPN President George Bodenheimer and Time Warner Cable CEO Glenn Britt. The real growth medium is the "intranet," otherwise defined as the on-demand and digital video-recording platforms provided by cable companies. "There’s less restriction on the intranet, it’s like your own corporate network for all the cable networks and even wireless," he elaborated in an interview after the panel. "It’s all locally driven anyways. It has a true neighborhood feel. If I’m in Dallas and I’m on Time Warner Cable, I want localized content." Mr. Cuban views the TV as the real computer, citing the decline in sales of desktop computers as a direct result of where media consumption is moving. "All that [content] is moving to the TV. What’s the difference between a PC and a TV? Nothing." Social networking and user-generated content are all the rage for Web 2.0, but there’s "nothing on the horizon" from a content perspective, he said (apparently glossing over the looming launches of NBC and News Corp.’s NewCo web-video venture and Joost). Broadband video, according to Mr. Cuban, has "stopped growing." "Before the internet, people were doing whatever they were doing, thinking this was the end-all, be-all. I thought by 2007 the pipes would be so huge [for the web], you could do HD content and all that. And everything just didn’t turn out. I was wrong," he said. Advertising for TV will also come with more of a premium price tag in the future, Mr. Cuban said. "There will be fewer commercials that cost more. The bang for your buck will become the same." But not everyone was quite as bullish as Mr. Cuban is on the growth of TV. Debora Wilson, CEO of the Weather Channel, listened to Mr. Cuban’s internet rant and interjected a few thoughts of her own on what she still considers to be a viable medium. "The internet is still in day two; there’s so much flexibility," she said. "The other opportunities on TV are still in a slow phase. I’ve been in the market for 15 years and we’re still waiting for that tipping point." The speaker was Mark Cuban, who sold Broadcast.com to Internet portal Yahoo in 1999 for $5.7 billion. He is currently the owner of the National Basketball Association’s Dallas Mavericks and HDTV programmer HDNet. He is also considering buying Major League Baseball’s Chicago Cubs, out of his pocket, for about $1 billion. The venture that made his fortune, Broadcast.com, was the outfit that legally streamed programming from 420 radio stations and networks; 56 TV stations and cable networks; and game broadcasts and other programming for more than 450 college and professional sports teams over the Internet. And Cuban made his comments to operators of a set of high-bandwidth alternatives to the Internet, known as cable systems. His basic point: The Internet has gone stagnant. The only “new application” on the World Wide Web of recent vintage was, in his view, YouTube — which, unlike Cuban’s Broadcast.com, ripped off the creative content of intellectual-property owners to build its video-based business. Sour digits aside, Cuban’s view, as repeated in a group interview after the panel with Multichannel News and CableFax Daily, is that cable and satellite networks are now superior to the Internet as platforms for building complex, interactive services. This is in direct counterpoint to his contention, when he built Broadcast.com a decade ago, that the Internet would — in 10 years’ time — have the bandwidth that would make it a superior home for the development and distribution of video programming. Networks built by telephone companies, like Verizon Communications, and cable companies, like Comcast, do not easily talk to each other, stymieing development of services (like HD video) that require smooth, seamless transport of lots of digital stuff, he said. By contrast, so-called clustered collections of cable networks provide an enclosed environment that allows high-bandwidth, complex applications to thrive. Developers will figure this out and develop applications to match. If, for instance, a developer wanted to build suites of office applications, he said, the better environment would be servers on local cable systems. Users would have faster response and better experiences. Such developers could “outgoogle Google,” in effect. Google, the dominant search engine, is developing and providing a series of office applications for writing and making calculations that operate on the open Internet. In effect, Cuban said, cable networks are “intranets,” which, by their nature, operate more efficiently than the Internet. Cable-system operators can control the quality of service they supply and the amount of bandwidth that developers can use. Plus, there is no friction in transporting services and data within their networks. His contention harkens back to @Home, the ill-fated offspring of the cable industry that tried to create a “private” Internet that operated at higher speeds and with greater quality than the “open” Internet, which made “best-efforts” attempts to transfer information, whether text or video or other. Using standards such as the OpenCable specifications and cooperative efforts to interlink their networks, cable-system operators, he added, could create a high-bandwidth nationwide alternative to the Internet that would attract developers of applications that needed and took advantage of greater capacity and speed of transmission. This entry was posted on Thursday, July 26th, 2007 at 4:49 pm	and is filed under Astronomy, NASA. You can follow any responses to this entry through the RSS 2.0 feed. You can leave a response, or trackback from your own site.